You can update the fee schedules you use to bill patients and insurance for services and products. Changing a fee schedule does not affect procedures that have already been posted or submitted to insurance. However, if you change the fee in a given fee schedule while logged on to any location, not only is the change accessible across the organization, but the procedure code will be updated for the locations that have that fee schedule as their preferred fee schedule. On the Settings menu, under Production, click (or tap) Fee Schedules. The Fee Schedules page opens. The options for editing the fee schedule become available. 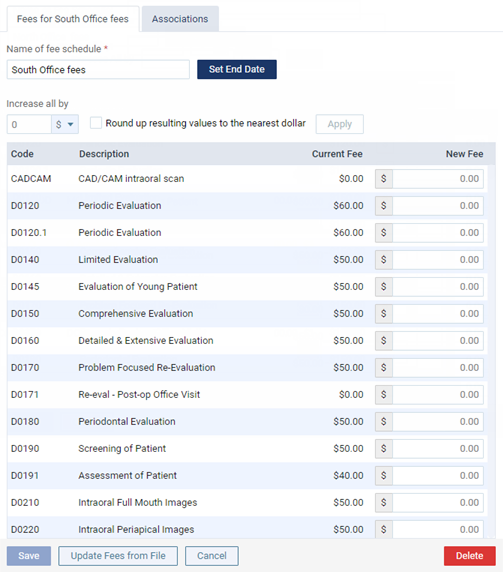 Change the name of the fee schedule and/or update the fee for each procedure as needed. To increase or decrease all the fees in the fee schedule by the same amount or percentage, next to Increase All by, type a positive or negative number (for example, 20 or -20), select $ or %, and then click (or tap) Go. Make changes to any of the New amounts as needed. 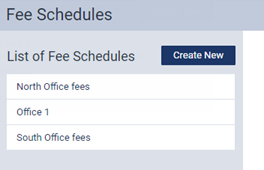 Note: If this fee schedule is the location's default fee schedule (the fee schedule that was created by the system automatically for the location), changing the fee of a procedure code here affects the fee for the same procedure code on the location's Procedure Codes page and vice versa. I hope there is a faster way to update fee schedule. I suggest we can export the form to an excel spreadsheet, fill them out and upload them back to the system. It took me 2-3 hrs to update 1 fee schedule. Our office contracted with 10 different insurance company, you can see you time consuming that would be. Thank you. Added this as a feature request. Click here to see it. I have not had an office tell me that it took hours to enter a fee schedule. Perhaps it is in the way it was entered. Once you click Settings - Fee Schedules and choose the fee schedule you want, it is not required to click save after entering each fee. You can start with the first fee and once the dollar amount has been entered (whole numbers only, you do not need to enter the .00) you can click tab to move to the next fee. If you do not perform a particular code, just hit tab again to move to the next box. Only when you are done (or need to do something else) do you need to click on save. I hope this helps. I agree with Greg. It took me about 2 hours to populate 13 fee schedules. The easiest thing to do is create your u&c fees, then use that schedule as a basis for the rest. Simple copy the u&c schedule when create a new insurance schedule and replace only the codes that have a dollar amount associated with it. Easy peasy! I am also finding it takes me close to 2 hours to update fee schedules. I am doing it exactly like the comment from Greg above (except we have a couple of fee schedules that are specific to the cent, so can't round the numbers! ), but to go through each code on a fee schedule and put in a new fee takes a lot of time! I just added another feature request similar to this...we have parts of contracted fee schedules that are based on percentage discounts and parts that are just numbers given to us. Need to be able to customize more. Changing all our fee schedules for Jan. 1 is going to take me close to 8-10 hours this year! Is there any way to print out the current fee schedule to have a hard copy? There is a custom report called Interactive - Fee Schedule. You can select which fee schedule to view then print it.